I received the following press release and reprint it here in its entirety. USCA (December 6, 2007) - The United States Cattlemen’s Association (USCA) is urging cattle producers and all those involved in animal agriculture to speak out against U.S. Senate Bill 311. Senator Mary Landrieu (D- LA) has succeeded in scheduling Senate Bill 311 for a floor vote, although a specific date has not been set for debate. Senator Landrieu’s bill has 37 co-sponsors. Senate Bill 311 reads "To amend the Horse Protection Act to prohibit the shipping, transporting, moving, delivering, receiving, possessing, purchasing, selling, or donation of horses and other equines to be slaughtered for human consumption, and for other purposes." The American Quarter Horse Association (AQHA) recently issued an alert stating, "This bill may have far-reaching effects on our members and their ability to buy and sell horses. Members may sell horses unaware of the buyer's intent with the animal and to where it may be transported, possibly resulting in legal ramifications for the seller. This legislation is vague and ambiguous and its passage could have far-reaching consequences." "The language in this bill is problematic for any horse owner and USCA believes it could set a precedent for the rest of animal agriculture," said Chuck Kiker, USCA Director Region V, Chair of USCA’s Animal Welfare Committee. "USCA encourages producers to get involved by educating their senators regarding the consequences of this legislation. People involved in animal agriculture need to remind their senators of the people involved in horse production and how a bill like this would affect them." I would have to say I agree with the USCA position here and urge people to contact their Senators to oppose this. I have. 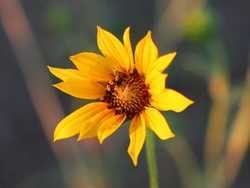 Wild Sunflower in Bloom. Taken 8/14/2006.